So there I was just walking through a town I don't normally go to regularly, when I thought I'd take a shortcut back to my car through Woolworths. I browsed briefly in the DVD section before I decided to go and check the toy section to see if they had the elusive Pokemon Trainer - James figure to complete my Team Rocket tribute on top of my stereo. It was a very small toy section. Not much there except Chicken Run figures when I spied a pack of these. Then I noticed they had been put under clearance. I had to get them. Then I saw there were more packs of differing figures so I grabbed all the different ones and headed to the till so I could get home and examine more closely this weird purchase. It seems as though the company who makes these things (F.E.V.A.) has decided to follow in the illustrious footsteps of Monster In My Pocket (M.I.M.P.) and to a lesser extent M.U.S.C.L.E. figures. There are 28 of these little strange figures to collect. Unlike M.I.M.P. though these creatures don't have points on them. No they have decided to combine M.I.M.P. 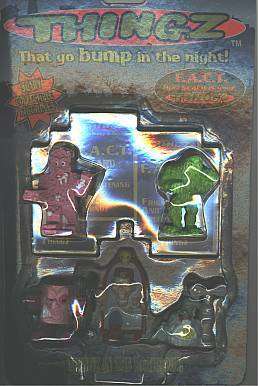 with Top Trumps as each figure come with its own F.A.C.T. 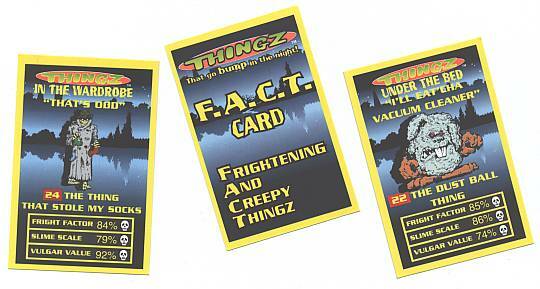 (Frightening And Creepy Thingz) card. On it, it has Fright Factor, Slime Scale and Vulgar Value percentages. Also unlike the two previously mentioned sets of figures, the packs these come in don't seem to be random as they are grouped together under rooms of the house. Hence we have Thingz in the wardrobe and Thingz in the fridge. As all these things are set in the house it makes me wonder why all the cards seem to have a backing picture of a lake with a city in the distance. Those crazy Thingz I guess. Just like to play with your head. Now whoever came up with these toys probably had a grand old time or may have been under the influence of something. I can see the reasoning. Kids like to collect stuff. Kids like monsters and gross stuff. M.I.M.P. has already been done. An episode of Goosebumps no doubt gave them the idea. But what I want to know is how they worked out all the different percentages for things. Vulgar Value is easy. How grim does it look. Slime Scale I am not even going to attempt to work out. But Fright Factor is the one that gets me. According to my F.A.C.T. cards my personal favourite Thing, The Thing That Stole My Socks (I did wonder where they all went) has a Fright Factor of only 84%. Whereas The Bed Bug Thing has a Fright Factor of 99% Now I'm sorry, but the thought of a weird thing in a dirty trenchcoat and trilby looking like a decomposing flasher going through my sock drawer in the night is more scary than a bug which I might accidentally step on. Also on each card it has a cheesy little saying for each individual Thing. For instance The Hanger Thing says "Just hanging around" and The Thing In My Boots says "We got sole". The last thing to mention is just like the Monsters In My Pocket had Monster Mountain to store them in, Thingz (love that z, it's so hip and street!) have two different storage containers. 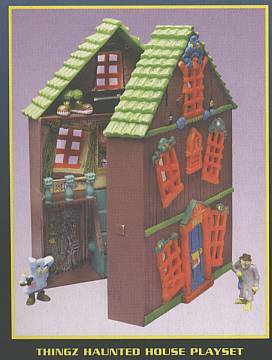 One is the Thingz Haunted House playset. 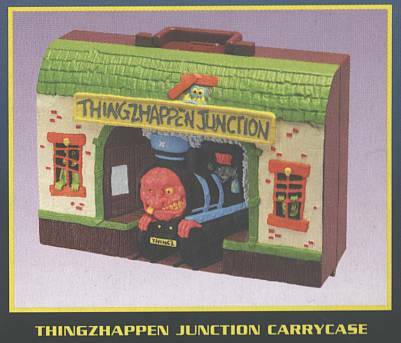 The other is the Thingzhappen Junction carrycase.Both of these are well detailed with well drawn art inside. The train station only has 12 paces for individual pieces but another section where you could carry all the others loose. Overall as a toy Thingz are quite good. The figures are different enough and have enough detail and more than one colour (unlike their two predecessors) and are well thought out. However at the prices these were meant to be (around £4 a pack of five) it seems fairly steep. Undoubtedly most other people thought so too as these were all on clearance, dirt cheap prices. Unfortunately it now means my computer is literally covered in these things. But the big question that I know you are asking is are these the weirdest toys ever? Well I would have said no, they're just odd if it weren't for another item you can get to go with them.